For those of you with dogs who just cannot seem to get enough of the great outdoors, we understand! However, sometimes your pup doesn’t know that they can’t handle the winter weather for very long. While most of our pets are covered in fur, some are just not equipped to be out in the cold and deal with the bitter temperatures. How can we make sure that your dog stays warm and in good health? Here are some of the top tips we have for keeping your dog safe on all your outdoor excursions this winter. Just as mountain climbers who are bundled up can still get hypothermia, dogs with coats can still get overwhelmed with cold in the winter. There are temperatures that can overwhelm all mammals’ heat regulation processes. When an animal’s coat gets wet, it is even less likely to be able to keep the animal warm. Your pup’s toes, ears, and nose are more vulnerable to colder temperatures when they are wet. That’s why your pet needs extra protection in the winter! While they can go outside, make sure you provide them with dry and warm shelter, lots of food, and plenty of water. Limit outdoor time when the temperature drops below freezing, however! If it’s too cold for you, it’s definitely too cold for your pet. Feel free to put a coat on your dog when taking them out, but keep a watchful eye! Putting a coat on your dog and sending them outside without supervision is a bad idea. First of all, the coat could get wet and put them at a greater risk of getting too cold. Second, they may try to escape the coat and get caught in such a way that could lead to strangulation. The salts that we lay down in the wintertime to keep the ice at bay can actually be quite harmful to our canine friends’ paws and burn them. If you want to buy protective boots for your pup, you may need to work them up to wearing the booties. Start with baby socks until they are comfortable, then move to the shoes. The dog boots, coats, and other winter gear was designed to be used with healthy, adult dogs. Puppies, kittens, or elderly pets shouldn’t be outside, regardless of how well-dressed they are. Most of these animals don’t have the fat, full fur coat, or metabolism that they need to stay warm in the frigid temperatures. When it’s cold or wet outside, keep these animals safe and sound inside! For those of you who are looking for additional dog care for your pup this winter, make sure to head on over to West Ballantyne Animal Hospital! We want to ensure that you have healthy, safe dogs at all times. 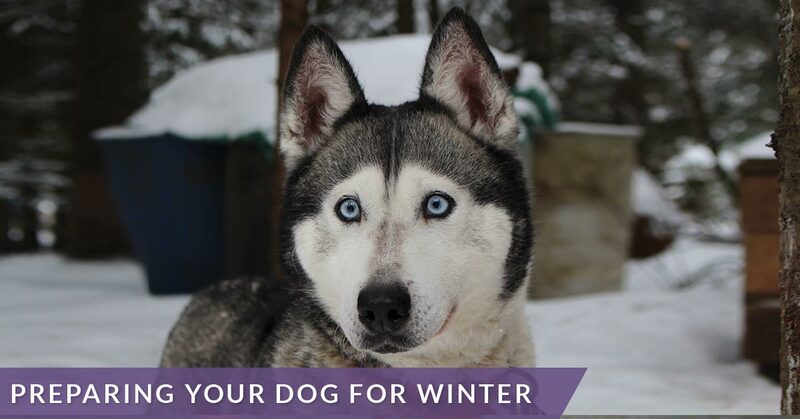 Ask us about our top winter care tips for all of your outdoor pets! We hope you stop in to see us soon, and that you have a happy and healthy winter season.